Home DOST Mayon Volcano PHIVOLCS PHIVOLCS Update for Mayon Volcano, 17 February 2018. PHIVOLCS Update for Mayon Volcano, 17 February 2018. 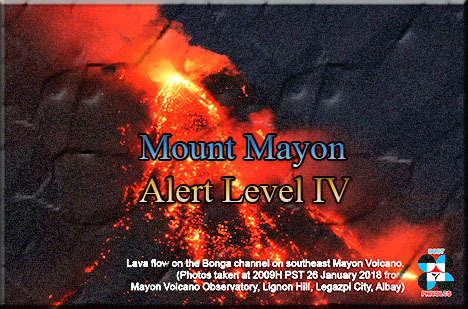 PHIVOLCS: MAYON VOLCANO BULLETIN 17 February 2018 8:00 A.M.
Mayon’s activity in the past 24 hours was characterized by sporadic and weak lava fountaining, lava flow and degassing from the summit crater. Discrete episodes of lava fountaining that lasted three hours and fifty-nine (239) minutes were accompanied by rumbling sounds audible beyond 10 kilometers of the summit crater. Incandescent lava fountains generated steam-laden plumes that rose 500 meters from the summit before drifting southwest and northwest. This was followed by a period of lull beginning at 7:15 PM until the early morning, until lava fountaining resumed at 1:03 AM. Throughout the night, lava flows and consequent incandescent rockfalls were observed in the Miisi and Bonga-Buyuan channels. Effused volumes of incandescent lava flows have advanced to 3.3 kilometers, 4.5 kilometers and 900 meters down the Miisi, Bonga and Basud Gullies, respectively, from the summit crater. Pyroclastic density currents or PDCs have deposited to the 4.6, 4.5 and 4.2 kilometer reaches of the Miisi, Bonga and Basud Gullies, respectively. A total of sixty-seven (67) volcanic earthquakes, most of which corresponded to lava fountaining events, and one (1) rockfall event were recorded by Mayon's seismic monitoring network. Sulfur dioxide (SO2) emission was measured at an average of 1,922 tonnes/day on 16 February 2018. Electronic tilt and continuous GPS still record sustained swelling or inflation of the edifice since November and October 2017, consistent with pressurization by magmatic intrusion.